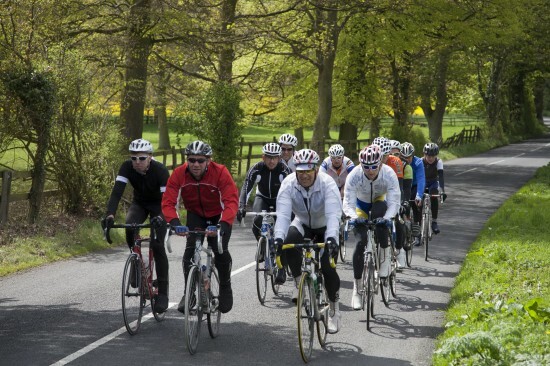 Irrespective of your goals, fitness or even how seriously you take your cycling; take it from us that if you learn ‘riding through’ in a group you will maximise your enjoyment of the sport and make it much easier for yourself. Riding on a flat road on a calm day, the factor which limits a cyclist’s speed is air resistance. Anyone who has ridden a bike in Ireland is well aware of air or wind resistance. At slow speeds there will be very little difference between the energy output of the sleek triathlete on a TT bike and the commuter on a sit up and beg model. But as they speed up or face into a head wind the smaller frontal surface area and cling film clothing of the triathlete will require them to put out less power than the flappy clothed, full frontal commuter. To travel at 30kph on a flat road with no wind, an average cyclist will have to generate around 95 watts. If a 16kph headwind develops then this cyclist will have to raise their power output to over 300watts to maintain their speed at 30kph. It is to deal with air resistance that cyclists have evolved the cooperative technique known as ‘Through and Off’ or ‘Bit and Bit’ or ‘Chain Gang’. Basically this involves riders taking turns to shelter the other riders from the wind. Those sheltering or drafting close behind another may only have to work at 75 per cent of the rate at which the leader is working. If you think of the example above, it would be very difficult for all but the very talented riders to maintain a power output of in excess of 300watts for more than a few minutes. By having a system whereby each individual only has to spend a few moments ‘pulling’ on the front at above 300 watts a group of riders can maintain speeds and spare energy that would not be possible riding individually. These six riders in Fig 1 above are riding into a head wind. The dark riders in the right hand line are moving very slightly faster than the 3 light coloured riders in the left hand line. In Fig 2 above the first dark rider in the right hand line has gradually passed by the leading light rider on the left hand line and moved into the left line. In doing this the first dark rider takes most of the impact of the wind sheltering the rest of the group. The first dark rider eases his/her pedalling effort marginally as soon as they are in the left hand line. This allows the second dark rider to move past gradually and into the left line. At the back of the group the last light rider begins to move to the right as soon as the last dark rider’s bottom bracket passes the light riders front wheel. This allows the last light rider to move smoothly into the right hand line onto the wheel of the last dark rider without having to accelerate hard. The group will keep this motion going so that the group is moving like a chain (hence the term chain gang). The formation above with an anti clockwise rotation of the riders is the default for a headwind or a headwind which hitting more on the left side. If the wind was more from the right side then the rotation of the ‘chain’ of riders would be in a clockwise direction. This is because the riders in the line going to the front are always in the more sheltered position. The key to a success here is smoothness. There should be very little difference in speed between the right hand line and the left hand line. There should be no acceleration by the rider coming on to the front. If he/she accelerates through it will cause the line behind to stretch out possibly opening gaps compromising the aerodynamic efficiency. The acceleration will mean the last rider will have to sprint to get into the right hand line. Repeatedly doing this is tiring. The result will be that riders won’t be able to pull as hard when they are on the front and the average speed of the group will go down. Acceleration costs far more energy than maintaining a constant speed. It is also important that the group rides close together. The right hand line going forward to the front should almost be brushing shoulders with the left hand line. All riders should be close to the wheel in front. Keeping the group close and tight like this stops the wind getting into gaps and maximises the aerodynamic efficiency of the group thus sparing energy for all the riders. Like any other skill, riding through and off needs to be practiced. A quiet, straight, flat road is the best place to do this. On the first few occasions that you practice do so at a very comfortable pace so you can concentrate on what you are doing. Keep your head up and look well ahead. When you are going to the front pass the leading rider gradually, without accelerating. It should take at least 5 second to pass him/her. Move gradually to the left into the other line checking that you are not putting the rider you have just passed into the ditch. Then ease your effort fractionally. When you are passed by the next rider coming to the front be ready to get into the shelter of his/her wheel when they move over in front of you. Stay close and slightly to the right of the wheel in front of you to maximise shelter and avoid gaps. When you are in the last place on the left begin to move towards the right line when you see the last rider’s bottom bracket passing your front wheel. If you wait until he/she passes you there will be a gap that you will need to close by accelerating. A further development of this technique is Echelon formation which is used to deal with crosswinds. We will look at this in another article. Aidan Ryan has been involved in track & road racing and mountain biking for nearly 40 years. He has won seven national track titles and represented Ireland on a number of occasions. He is a level 3 coach and holds a degree in physical education. Aidan has coached riders of all levels from beginner mountain bikers to European track champions, from leisure riders to ultra-distance record holders.